In October 2014 the Archive received some materials from Diana Lusher, wife of the late jazz and big band trombonist, Don Lusher. Don (1923–2006) started playing trombone aged 6 and joined the Peterborough Salvation Army Band, following in the footsteps of his father and grandfather. During World War II he was called up and served as a gunner-signaller in the Royal Artillery. On leaving the armed forces, he entered the world of professional music and played with the bands of Joe Daniels, Lou Preager, Maurice Winnick, The Squadronaires, Jack Parnell, Geraldo and Ted Heath, with whom he played for two decades (1953–73) as lead trombonist. In 1974, he formed his own big band and, after the death of George Chisholm, also joined trumpeter Kenny Baker’s Best of British Jazz band. Don taught trombone at the Royal College of Music and the Royal Marines School of Music. He was appointed OBE in 2003. 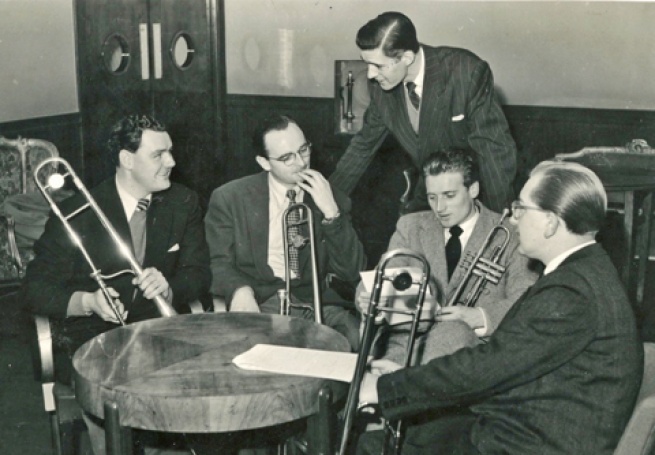 The materials donated to the Archive include photos from the big band era including this photo of some of the musicians from Jack Parnell’s band: Jim Wilson, Harry Roche, Jack Parnell, Jimmy Watson and Don. Check out the Archive for more on Don Lusher. We have interviews, many photographs and many journals like Crescendo that have mentions of Don. Just type Don Lusher into the search box.